I can feel it. I can taste it. I can smell it in the air. I can see it in the trees as they put on their summer leaves and change from the skeletons of winter that they once were. It's summer and it's time to begin the chase once again. The water is high and the fish are few but they are there. And they are hot! The early season fish are some of my favorite and you tend to see backing a lot. Many of the early fish are never seen, just felt.Like a bolt of lightning they hit and run, then they are gone just as fast. These early fish are very aggressive to the fly as they have not seen any offerings yet. They hit with wild abandon chasing the fly across the pool for yards, tracking it like a heat seeking missile. 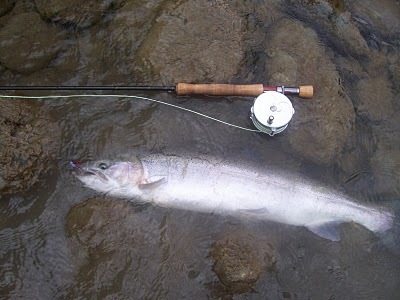 These early North Umpqua wild summer run fish are simply amazing! There was a time in the not so distant past when the North Umpqua had fresh fish coming in during every month of the year. The line between winter,spring,summer and fall was blurred. Genetically unique strains of fish had adapted to different specific tributaries and they all had slightly different run timings. Over the years, the friends that I fish with and I have made note of several different types of these historic fish that still persist, late spring fish and late fall fish being the two main categories we see most. In both cases you know when you have caught one of these fish by the distinct look and time of the year you see them. This is especially notable in fall when all of the sudden you hook a dime bright fish in late October or November when every other fish in the ditch has fall colors. It's striking, and you begin to realize it is just another creature altogether. Same with these blindingly bright and ballistic late spring fish.They are just a different breed. You just know when you are attached to one. It resonates up the line, through the rod and into your very core. I can't explain it, it just is what it is.....awesome! These late spring/early summer fish are what remains of genetic strain that is all but gone. Their genes passed down from fish reared in tributaries that were devestated by logging and the road building and the destruction that followed. Human progress and greed slowly took their toll. But somehow they hang on. They are resilient, and very special. It is my hope that in the near future, restoration of some of these historic spawning grounds will take place and we can again see more of the genetic diversity that this river was known for. I would like to see the state and Feds sink a couple million into Canton Creek, Boulder Creek, Copeland Creek,and every other viable tributary instead of the hatchery clone factory that gets all the money now. We might be amazed at what happens. From your blog to God's ears! Bravo, and best wishes for a great summer! Here's to an awesome season for all! That looks like a Dean River fish.